Along with ground round and ground sirloin, ground chuck is a type of ground beef. Each cut has varying degrees of fat versus lean content. Ground chuck must come from only the chuck cuts of beef, which are located in the shoulder area and are more fatty than round or sirloin cuts. However, various methods of cooking can decrease the final fat content. 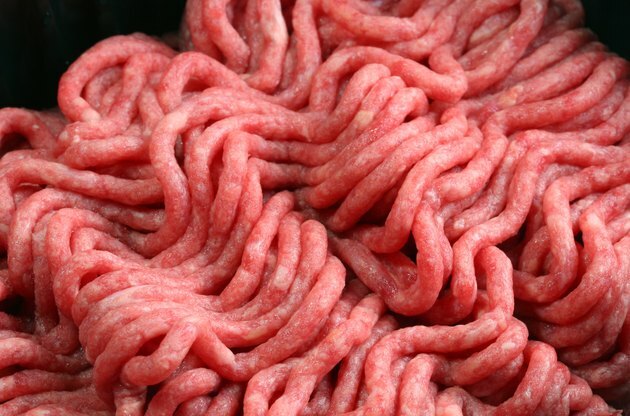 According to the United States Department of Agriculture Food Safety and Inspection Service, the maximum allowable fat content in any hamburger or ground beef is 30 percent, or 70 percent lean. Ground chuck ranges from 80 to 85 percent lean. Ground round is 90 percent lean, and ground sirloin is 97 percent lean. In the past, meat labels were required to provide only the primal cut of meat and not the fat versus lean percentage. Lean content of ground chuck is measured when the meat is raw, so the method of cooking has an impact on the final calories consumed. According to the Alabama Cooperative Extension System, "Researchers have found there is a difference of only about 9 calories per quarter-pound patty," and even though raw meat may be fattier, there is not much difference after cooking. They state that regular ground beef loses more fat during cooking, but the leaner cuts like ground chuck, lose more water. The USDA Food Safety and Inspection Service announced changes to their meat and poultry nutrition labeling requirements: Effective January 1, 2012, major cuts of meat, including ground and chopped meat, will be required to be packaged with nutrition labels that include calories, grams of fat, grams of saturated fat, lean percentage and fat percentage. Changes in labeling will help consumers make informed choices. Dr. Barbara Ingham, food science extension specialist at the University of Wisconsin suggests rinsing cooked ground chuck crumbles prior to eating to reduce fat content. Try this: After browning beef, remove beef crumbles and place on 3 layers of paper towels; let sit 30 seconds to 1 minute, blotting top of beef with a paper towel. Transfer beef to a strainer or colander and pour water that has been heated to 150 to 160 degrees over the ground chuck. For burgers, meatballs or meatloaf, blotting the meat without rinsing it (and cooking it on a rack, elevated from fat drippings) will also reduce final fat content. Does a Well-Done Steak Have the Same Nutrition as a Rare Steak?